Hey everyone, I know its been awhile since I've kept you all up to date, but here we are. In new news we have one new partner, and a new sponsor. Our new sponsor as long as things go through is Empire Paintball under their Amateur Woodsball League as a scenario team. Our new partners are New England Warrior. http://www.newenglandwarrior.org/ Please check out their site, and support them. More to come on them. In other news we have recruited new members and are awaiting their bio's, photo's, and set up. Our next big game this summer is I.O.N up at Skirmish Paintball in Jim Thorpe Pennsylvania. That is all for right now. Well I know it has been awhile since our last update, but we are back. To start off, First Recon has now become Theta Squad. Theta Squad is still run by Sean, but with a different role and name. The West Point Combat Classic is coming up this weekend, We will be fighting for the Blues, aka United Nation, under Command of the one and only Eric Engler. We will have a recruitment booth set up out of our truck with our supervisor's running it during the game. Around lunch and through breaks we will be there for a short time if you have any questions. This week will be a lot of preparations for the game and for our booth. Until tomorrow, this is Sean saying have a good night. Well were back from a day of paintball at ABC. Overall it was a good day aside from Aaron and Noah not being able to make it. They missed out on a fun day. Overall I managed to get the word out about Tin Can Militia and the upcoming West Point scenario. That's it for now everyone. Hope you all had a great St.Patrick's Day (I know I did!) and a good weekend. I will see you all within the next few days. Keep on checking back. Site update. Sorry I didn't get much done the past few days, Ive been busy with training and a few other events with some friends. As some of you know I will be buying the site domain within a month or so which will be beneficial to us in the long run. I have updated the roster page and began uploading new photo's. This is all for now, see you all in a day or two. Our youtube account is now created. Go to the link here to view our channel. Don't forget to subscribe. Hey everyone. I have another Site update for you all. To start lets welcome Noah Dankner, Christian Ribeiro, and my brother Bryan Flaherty to Tin Can Militia. If you look at the picture to the left you will see me on the left (Sean), Followed by John, Aaron and Noah. Along with the site updates, I will be fixing the grammar on the site, as well as updating the Roster, Ranks, and the Forum. New pictures will be added this weekend. Tomorrow Friday March 4th, The Roster page will be updated, and new photo's will be added to view. We will start recruiting off of the major paintballing threads. As well to recruitment were going to create a YouTube Channel for Tin Can Militia. In our channel you will find DIY guide's, Update video's, training day's, game footage, and new equipment. Please stay tuned this weekend for site updates. Check back Friday March 4th at 3:00pm for the first updates of the weekend. To see our new members, go to our facebook page. The link is located in the tab bar to the left. That is all for tonight, Have a good night everyone and I will see you all on the weekend. I have updated the Forum, as well as the First Recon page. I'm going to stop adding links to each page in the update due to the fact, it is really a pain. So just read the updates when you come on and just enjoy. The radio's have arrived today and in working order. Ill give you the link in the new Sale Hunter Forum where any deals on any site can be found. Paintball related items only. By that I mean gear, and equipment. As well as updates go, I'm going to be expanding or recruitment to PBNation, TechPB, and the New Breed Forum. The Ranking structure is being updated as a picture, if not just going to be a list of who is there. Anyway for anyone who wants to join please go to the Contact Us page until we set up a application for you to email us. Keep checking back for more updates. I try to update the site every week. Anyway that's all for tonight, See you all in a few days. New to the site are the pages. We have now included the sub groups within the Militia. This includes First Recon the scout squad, and Bad Company. A well as adding the new regiments within the team, I have also included a rank board which will be updated soon. Also check out the Photo Album for newly added pictures. I have also updated the Roster page and the Upcoming Scenario page. A new big addition to the site is a site Forum! The Forum is currently being worked on so keep checking in for updates. I will try to update the site daily and make an announcement of it in Facebook group and here on the site. Within the Field Of Use page I have updated the fields and information. More information on each field will be updated in the near future, also next to each section I added the field logo's. That's all for Friday night, Enjoy you're weekend and have fun. In recent meetings, Tin Can Militia has now issued rank's, and regiments that will be implemented into play. More information and pages to come on each of them so keep on checking in for updates. As well as checking the facebook group daily for informational updates on the site and video's. With the creation of our facebook page, and planning we have done over the months I have come to update the site. Sorry I haven't been up to date with it, We all had midterms and little time to meet up and talk. Now with midterms over, we can now resume our work on getting this team built up. Welcome to the Tin Can Militia Homepage. Welcome to the Tin Can Militia homepage. 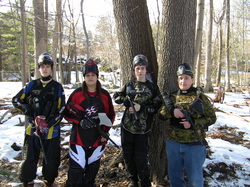 We are a newly formed paintball scenario team on the east coast. If you would like to join or find out more, head to our contact us page on the site. More info to come.